Author: Christine Dorresteyn Stevens, EdD, MT(ASCP), et al. Section A meets the 1-hour Florida specialty requirements in serology/immunology, clinical chemistry, and hematology. For ASCP, it provides 8 hours in serology/immunology, 2 hours in clinical chemistry, and 2 in hematology. Section B meets the Florida 1-hour requirement in serology/immunology. For ASCP, it provides 12 hours in serology/immunology. 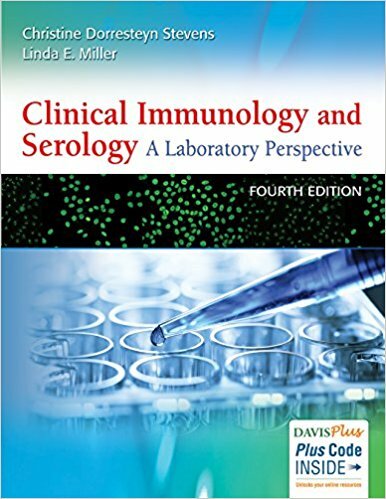 Clinical Immunology and Serology: A Laboratory Perspective has been completely updated and revised to reflect the latest advances in science and clinical practice, including coverage of the external defenses and inflammation, human microbe relationships, bacterial virulence factors, the role of the B and T cells in the adaptive immune response, the immune mechanisms involved in humoral antibody production and cell-mediated immunity, and tumor markers and immune mechanisms. It also covers quality assessment, regulatory issues, and quality management systems. An access code inside new printed texts provides you with a Davis Digital eBook, that lets you quickly search for content.